The journal adheres to the Code of Conduct and Best Practice Guidelines set forth by the Committee on Publication ethics (COPE), World Association of Medical Editors (WAME) and International Committee of Medical Journal Editors (ICMJE). 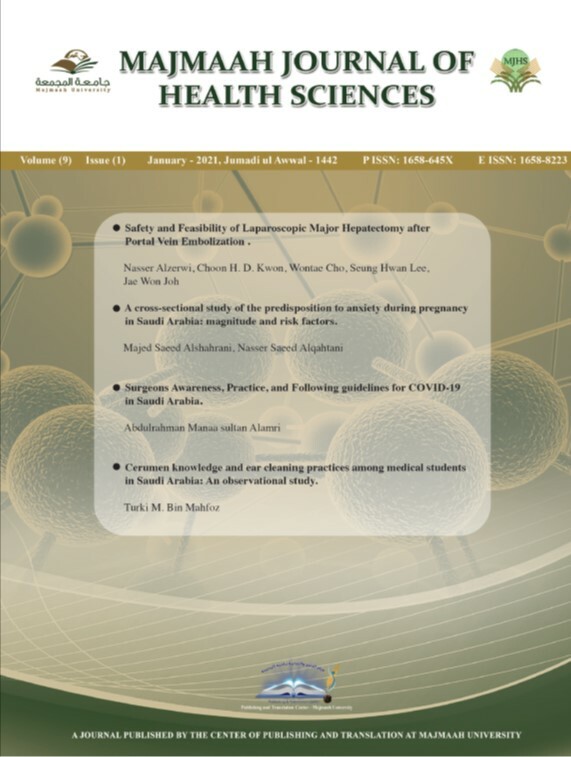 The Majmaah Journal of Health Sciences (MJHS) aspires to select, through peer review, the highest quality manuscripts related to Health and Rehabilitation Sciences. To achieve this, the entire peer review and publication process of the MJHS thrive to be thorough, objective, and fair. Every aspect of this process involves important ethical principles and decisions. The reputation of MJHS depends on the trust of readers, authors, researchers, reviewers, editors, health professionals, research subjects and funding agencies. This trust is enhanced by describing as explicitly as possible MJHS policies to ensure the ethical treatment of all participants in the publication process. The MJHS considers papers in which research has been conducted to high standards of quality control and data analysis. Data and records must be retained and produced for review upon request. Fabrication, falsification, concealment, deceptive reporting, or misrepresentations of data constitute scientific misconduct. The MJHS adheres to the basic principles of the Declaration of Helsinki of the World Medical Association (http://www.wma.net/en/30publications/10policies/b3/17c.pdf). Present practice of the MJHS is to ask authors of submissions to state whether their studies involved human participants, and, if so, whether they have satisfied review on ethical grounds by an appropriate institutional review board (IRB) or whether such an IRB has found their studies to be exempt from review. The statement on Human Participant Protection at the end of published pieces shows whether studies have been approved or exempted by a named IRB. If human participants are involved, a statement of approval by an institutional review board (IRB) and the participants’ informed consent is required. It is the responsibility of the lead author to keep a copy of the IRB approval received in his/her personal file. Authorship implies a significant intellectual contribution to the work, some role in writing the manuscript and reviewing the final draft of the manuscript. For all manuscripts, the corresponding author in collaboration with co-authors must provide information on the specific contributions each author has made to the article. Simple copy-editing does not warrant co-authorship or acknowledgements. Example: All authors provided concept/idea/research design. Dr Campo, Dr Weiser, and Dr Koenig provided writing and data analysis. Dr Campo provided data collection, project management, and fund procurement. Dr Weiser and Dr Koenig provided consultation (including review of manuscript before submission). All authors must take responsibility in writing for the accuracy of the manuscript, and one author must be the guarantor and take responsibility for the work as a whole. Acknowledgements are acceptable for people who do not qualify as authors but provided support for the study and manuscript. Examples of suitable acknowledgements may include: people who provided assistance with technical analysis, manuscript preparation, study design, or data collection. Other entities may include funders, in-kind contributors, clinician investigators or interviewers. Additional guidance on authorship and acknowledgements is provided by the International Committee of Medical Journal Editors (available at http://www.icmje.org/#author). Conflicts of interest (competing interest) include facts known to a participant in the publication process that if revealed later, would make a reasonable reader feel misled or deceived (or an author, reviewer, or editor feel defensive). Conflicts of interest may influence the judgment of authors, reviewers, and editors; these conflicts often are not immediately apparent to others or to the reviewer. They may be personal, commercial, political, academic, or financial. Financial interests may include employment, research funding (received or pending), stock or share ownership, patents, payment for lectures or travel, consultancies, non-financial support, or any fiduciary interest in the company. The perception or appearance of a conflict of interest, without regard to substance, alone creates conflict, since trust is eroded among all participants. All such interests (or their absence) must be declared in writing by authors upon submission of the manuscript. If any are declared, they should be published with the article. If there is doubt about whether a circumstance represents a conflict, it should be disclosed. Sources of full or partial funding or other support for the research must be declared and should be described in an acknowledgement if the manuscript is published; if anyone besides the authors is involved in analysis, interpretation, or control of the data, this must also be declared. The role of the funding organization or sponsor in the design and conduct of the study, in the collection, analysis, and interpretation of the data, and in the preparation, review, or approval of the manuscript should be specified. Peer reviewers for the journal should annually declare to the editor-in-chief any similar competing interests, financial or non-financial, that might affect their work for the journal. Non-financial competing interests may include a similar manuscript under review in the same or another journal, a similar research project nearing completion, a close collaboration (or competition) with one of the authors of the manuscript, etc. Additionally, any reviewer who has reason to believe he or she may have a conflict of interest on a particular manuscript should be required to reveal that conflict to the editor, who will then determine their appropriate level of involvement. Editors can also have conflicts of interest, and members of the editorial team (just like authors and reviewers) should be required to declare any possible conflicts of interest as and when they arise (these will differ according to the level of involvement of editorial team members, but should be addressed for all). Editors assigned the review of a manuscript in which they may have a conflict of interest should refuse themselves from that supervision, and it should be reassigned to an editor with no conflict. Manuscripts authored by members of the editorial team present a special instance of potential conflict of interest. The review of these manuscripts must always be supervised by the editor-in-chief, who will review the decision of the assigned decision editor for objectivity before the decision is final. The MJHS does not publish work that has been published elsewhere, with the exception of work that has been presented as an abstract or in a report of a scientific meeting, or reprinting of classic papers that have historical value. Plagiarism is scientific misconduct and includes the use of others' published and unpublished ideas or words (or other intellectual property) without attribution or permission, and presenting them as new and original rather than derived from an existing source. The intent and effect of plagiarism is to mislead the reader as to the contributions of the plagiarizer. This applies whether the ideas or words are taken from abstracts, research grant applications, Institutional Review Board applications, or unpublished or published manuscripts in any publication format (print or electronic). Self-plagiarism refers to the practice of an author using portions of their previous writings on the same topic in another of their publications, without specifically citing it. All previous work from the author(s) should be properly cited if used in submitted manuscripts. Falsification of data: ranges from fabrication to deceptive selective reporting of findings and omission of conflicting data, or willful suppression and/or distortion of data. Plagiarism: The appropriation of the language, ideas, or thoughts of another without crediting their true source, and representation of them as one's own original work (see prior section). Improprieties of authorship: Improper assignment of credit, such as excluding others, misrepresentation of the same material as original in more than one publication, inclusion of individuals as authors who have not made a contribution to the work published; or submission of multi-authored publications without the concurrence of all authors. Misappropriation of the ideas of others: an important aspect of scholarly activity is the exchange of ideas among colleagues. Scholars can acquire novel ideas from others during the process of reviewing grant applications and manuscripts. However, improper use of such information can constitute fraud. Wholesale appropriation of such material constitutes misconduct. Violation of generally accepted research practices: Serious deviation from accepted practices in proposing or carrying out research, improper manipulation of experiments to obtain biased results, deceptive statistical or analytical manipulations, or improper reporting of results. Material failure to comply with legislative and regulatory requirements affecting research: Including but not limited to serious or substantial, repeated, willful violations of applicable local regulations and law involving the use of funds, care of animals, human subjects, investigational drugs, recombinant products, new devices, or radioactive, biologic, or chemical materials. Inappropriate behavior in relation to misconduct: this includes unfounded or knowingly false accusations of misconduct, failure to report known or suspected misconduct, withholding or destruction of information relevant to a claim of misconduct and retaliation against persons involved in the allegation or investigation. This includes qualifications, experience, or research accomplishments to advance the research program, to obtain external funding, or for other professional advancement. A committee consisting of the editor-in-chief and editorial board members, as determined by the editor-in-chief, who have specific expertise in the area being investigated, will investigate misconduct allegations. The suitable actions were taken based on the recommendations of Committee on Publication ethics (COPE), World Association of Medical Editors (WAME) and International Committee of Medical Journal Editors (ICMJE). Acknowledgments: This document was drafted based on modifications to “Based on WAME – Recommendations on Publication Ethics Policies for Medical Journals” developed by the World Association of Medical Editors (http://www.wame.org/about/recommendations-on-publication-ethics-policie, accessed 19th August 2014) as well as other resources as referenced throughout this document from organizations including the World Medical Association and the International Committee of Journal Editors.